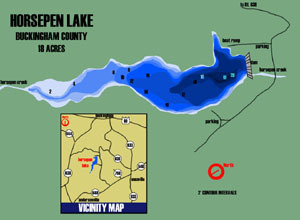 Horsepen Lake is a 19-acre impoundment located entirely within the Horsepen Wildlife Management Area in Buckingham County, Virginia. The lake is one of several department-owned lakes created in the 1930’s. The lake underwent repairs on the riser tower after the lake developed serious leaks in 2001. The impoundment is now full and was restocked in the summer of 2002. Fishing reopened in the spring of 2005. Horsepen is managed for warmwater fish species including largemouth bass, bluegill, redear sunfish, and channel catfish. The Virginia Department of Game and Inland Fisheries (DGIF) will require an Access Permit for visitors to department-owned Wildlife Management Areas (WMAs) and public fishing lakes, who are age 17 and older, unless they possess a valid Virginia hunting, freshwater fishing, or trapping license, or a current Virginia boat registration. Learn more about the Access Permit. Largemouth bass once again swim the waters of Horsepen Lake. Restocking began in 2002 to replenish the fishery that was lost when the lake drained. It will take some time for bass to fully mature and provide a good fishing opportunity once more but the population is doing well. Numbers are increasing and fish have begun to naturally reproduce in the reservoir. Fish up to 15 inches were already sampled in the spring 2005 sample so the future looks bright for anglers seeking quality fish in a small impoundment setting. The bass population is being managed to produce a trophy fishery and the restrictive regulation is in place to achieve that trophy fishery goal. Biologists are hopeful that Horsepen will be something to brag about in the near future. Bluegill and redear sunfish were also stocked at Horsepen in 2002. Currently, most bream are small but expanding their population. All fish sampled in 2005 were less than 8 inches but the fish are naturally reproducing and hopefully some bigger fish will start to show up in the fishery. Horsepen provides an excellent opportunity for kids to experience fishing with several areas around the lake where bank fishing is accessible. Almost 300 channel catfish are stocked annually to maintain the fishery. Catfish from the first stocking should be reaching a minimum of 12-14 inches by now so enjoy the fishery. Hours of use: 24 hours per day. Horsepen Lake has a single lane boat ramp and a gravel parking lot. There is also a covered pavilion with picnic tables located adjacent to the lake. Bank fishing access is limited to the lower section of the lake near the pavilion. Several fish attractors have been constructed for both bank and boat fishermen. These include hinge trees, brush piles and various other structures scattered throughout the lake to concentrate fish.